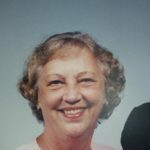 Jacqueline Ann Michaud (Born 3/1/30) passed away at the age of 89 on April 10, 2019 at Walter Reed Hospital in Gloucester VA.
She was preceded in death by her husband Rudy A. Michaud Sr.; her parent’s Frank and Fanny Floyd, and her brother Frank Floyd Jr.
Left to cherish so many wonderful memories are her brother William (Bill) Floyd; her sons Rudy and wife Cindy, Ronnie and wife Candy; her grandson Daniel Michaud and wife Denise; granddaughters Hollie Minnick and husband Danny, Heather Balmain and husband Adam, Krisky Amos and husband Chucky and great grandchildren Owen Fostek, Chloe Amos, Jake Minnick, Joey Minnick, and Daniel Minnick. Our family would like to thank everyone at the Gloucester House and Emergency / ICU staff at Walter Reed Hospital for their care and compassion while taking care of our mom. A graveside service will be held at Peninsula Memorial Park at 10 am on Saturday, April 13, 2019.